For many companies, electricity usage is the primary source of their greenhouse gas emissions. To dramatically reduce these emissions and fight climate change, a growing number of organizations are switching to green power, which is generated from eligible renewable energy sources, such as solar photovoltaics, wind and low-impact hydropower. Since 2001, the U.S. Environmental Protection Agency's (EPA) Green Power Partnership has been working with organizations to help them make this change. The Partnership is designed to drive U.S. renewable energy supply by increasing demand of green power among leading U.S. organizations. By partnering with EPA, a company can benefit from EPA's credibility, technical assistance, recognition, and up-to-date market information. Today, nearly 1,300 organizations are Green Power Partners, including many Fortune 500 companies, small and medium-sized businesses, local, state, and federal governments, and colleges and universities. Overall, Partners are using 18 billion kilowatt-hours of green power annually. By using green power, an organization not only can dramatically reduce its carbon footprint but it may also be able to save money, stand out from competitors, and meet corporate environmental goals, which is of growing importance to stakeholder groups such as customers, Wall Street analysts, shareholders, and employees. Partners have found by taking advantage of EPA's assistance, they can save time, effort, and cost in buying green power, better estimate the environmental benefits of switching to green power, and better promote their green power commitment to media and others. EPA recognizes the actions of its leading Partners through the program's national- and sector-focused Top Partner Rankings. EPA's National Top 50 list recognizes the 50 largest green power purchasers in the program and receives wide media attention. This list is currently led by Intel, Kohl's Department Stores, Whole Foods Market, the City of Houston, and Dell. 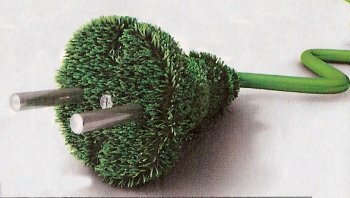 Green Power Partners represent virtually every sector of the economy and purchase green power for a variety of reasons. Two companies in particular--Kohl's Department Stores and Wal-Mart--provide useful case studies for the many ways in which Partners are working to address climate change. Kohl's Department Stores is one of the world's largest retail solar hosts, with solar panels at stores and distribution centers in California, New Jersey, Wisconsin, and Connecticut. The company recently activated its 100th solar system in New Jersey in September 2010. Kohl's has been reaping the economic benefits of on-site solar generation since 2007 when it first entered into an innovative procurement model known as the Solar Power Purchase Agreement (SPPA). Through this financial arrangement, a third-party developer owns, operates, and maintains the solar photovoltaic system while a host customer agrees to site the system on its roof or elsewhere on its property and purchases the system's electrical output from the provider for a predetermined period. The agreement allows the host customer to receive stable, and sometimes lower cost electricity, while the solar services provider acquires valuable financial benefits such as income generated from the sale of electricity to the host customer. A growing number of Green Power Partners, such as Staples and Kohl's, have taken advantage of this approach. Wal-Mart has steadily invested in green power as part of its long-term goal of being supplied by 100 percent renewable energy. In September 2010, the company announce plans to add solar systems to another 20 to 30 Wal-Mart stores, Sam's Club locations and distribution centers in California and Arizona, and the majority of these locations will feature solar thin film solar technology. For its Texas stores and facilities, Wal-Mart began purchasing wind power in April 2009 as part of a four-year wind power purchase agreement with a Duke Energy wind farm in Texas. This farm generates roughly 226 million kilowatt-hours of renewable energy annually, which supplies up to 15 percent of the electricity demand for Wal-Mart's Texas stores and facilities. Collectively, Wal-Mart's annual on-site green power production and purchased wind power totals more than 260 million kilowatt-hours. Mountain Construction does custom home building in any building style, including conventional new homes, remodeling and restorations, log and timber frame home and structural insulated panel homes. Check out our site and learn more about Log Home Building as well as our Construction and Remodeling services.